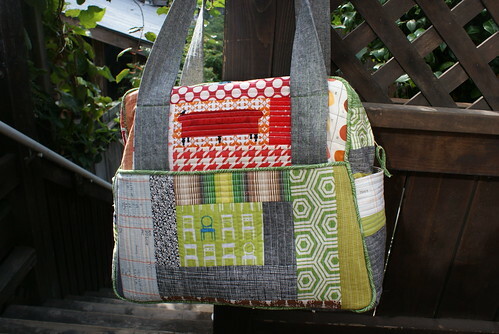 I made a quilt-as-you-go version of Amy Butler’s Weekender bag. Here are my notes. 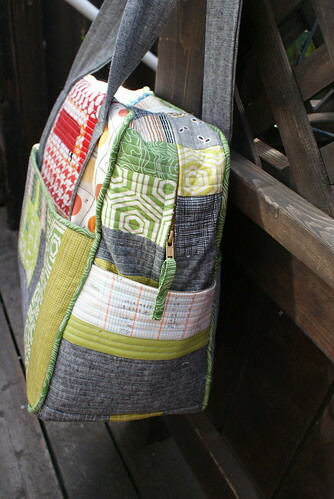 I think that one of the most popular quilted versions of the Amy Butler Weekender Bag is the one by Oh, Fransson. Like Oh, Fransson, I used cotton duck (from my stash) and lots of long scraps of batting leftover from the edges of quilts. I bought my pattern locally at Stone Mountain and Daughter. The zipper is a #5 36″ separating zipper in buttercup from Zipperstop’s Etsy shop. The purse feet were purchased locally at Laci’s but if I had to do it again, I would check out Jo-Ann’s. I bought the biggest ones they had at Laci’s, but I think there was one slightly bigger made by Clover and Nancy Zieman. I recommend getting 6 feet. I tried to use only material from my stash. 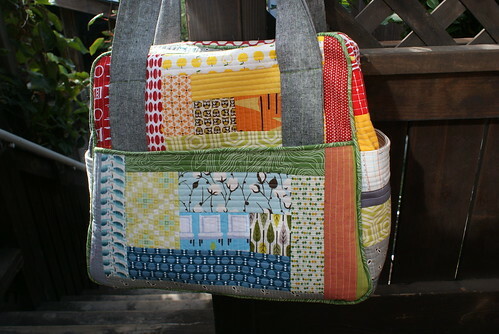 The outside is obviously scrappy patchwork and the inside was cotton ticking that I bought as a remnant a while ago. I used iron-in interfacing on the pocket panels, and 1 layer of Peltex in the bottom. 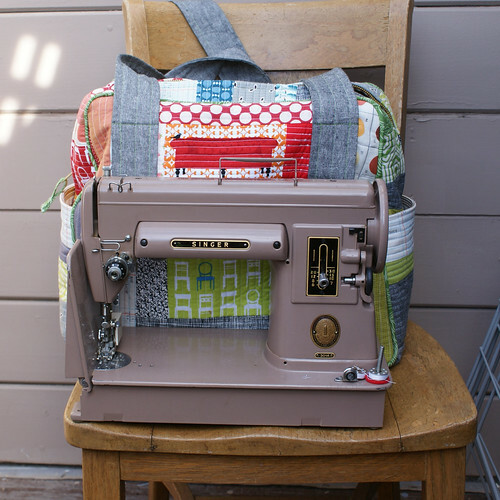 All parts were sewn using my Singer 201. I used the walking foot for the quilting, and cording foot to make the piping. The Singer 201 has tons of power, but I still had to go slow at the end when I was sewing through all of the layers of fabric. I made my handles longer. They extend approximately 16 inches from the top of the bag which is perfect for going over my shoulder. I also used about 4 thicknesses of fabric and some interfacing to support the handles. 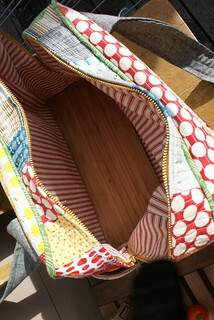 I added an interior zippered pocket. I didn’t go crazy with the inside pockets since I think it would just make the lining sag. I used a lovely piece of laser-cut bamboo for the bottom of the bag. I didn’t enclose it in anything should I choose to remove it. Plus it looks nice just like it is. If you want one, you can order one from my Ponoko shop, and I can send it to you in about 2 weeks. I like the quilt as you go tutorial at Stitched in Color – maybe because I like the fabrics that she used. The icing on the cake was the discovery that this bag makes the perfect carrying case for my singer 301. One Response to "Quilted Weekender Bag"
this was very helpful! thank you so much! I am planning to give this pattern a go in January and am doing a bit of research now.